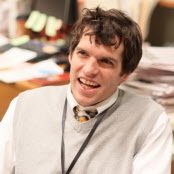 Tim Simons, a native of Readfield, stars in the new HBO series "Veep." When Tim Simons was a teenager working at a video store in Winthrop, he sometimes would get starstruck when actors from the nearby Theater at Monmouth would come into the store. He got a little bashful, but only because he wanted to be onstage with them someday. Seven years later, after college, Simons did get his chance to perform with the theater. Ten years after that, he has made his national acting debut with his first major role — Jonah Ryan, a conniving, fast-talking, highly entertaining White House liaison on the acclaimed new HBO series “Veep,” which airs at 10 p.m. Sundays. 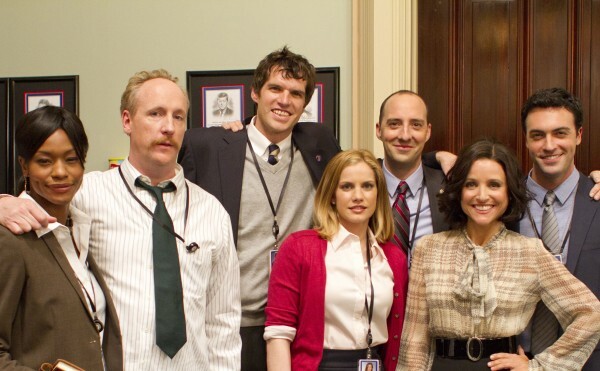 Simons stars with Julia Louis-Dreyfus, who plays fictional vice president Selina Meyer; Tony Hale of “Arrested Development” as Meyer’s personal aide Gary Walsh; Anna Chlumsky as chief-of-staff Amy Brookheimer; and Upright Citizens Brigade improv comedy co-founder Matt Walsh as the vice president’s assistant and communications director Mike McClintock. It’s Simons’ big break, and for the University of Maine graduate, it has been a long time coming. Simons knew from an early age that performing was what he wanted to do with his life. After graduating from Maranacook High School in 1996, Simons attended the University of Maine, studying theater and appearing in a number of productions with the department and with the Maine Masque. So after graduating in 2001, Simons packed up and left Maine with the intention of traveling around the country and eventually settling in either New York City or Los Angeles. He got an internship at a children’s theater in Kentucky but soon realized that living in different places in two- or three-month spurts wasn’t really his style. After performing with the Theater at Monmouth over the summer of 2002, he moved to Chicago, where he fell in with the city’s independent theater scene. The first two years were tough for him. As Simons says, you have to be somewhat delusional to try to make it in a place as competitive as Hollywood. But in 2010, after appearing in a funny commercial, a casting director friend took note of his performance and passed Simons’ name along to the producers of “Veep,” for which he auditioned five or six times. “Veep” is notable for a number of reasons but the thing that really sticks out is its fast, improv-based comedic style, a hallmark of creator Armando Iannucci’s work, which includes the Oscar-nominated 2009 movie “In the Loop” and the BBC political sitcom “The Thick of It.” Where Louis-Dreyfus and Walsh are improv veterans, Simons had to brush up on his skills to keep up. “Veep” was picked up for a second season in late April, so people can expect to see Simons’ face on their TV screens for more Sundays to come. In addition to being busy with the show, he and his wife are extremely busy with newborn twins, Hopper and Marty, who were born in December 2011. Simons’ family back in Maine — mom and dad Susan and Ron Simons, and siblings Dan Simons, a musician, and Lacy Simons, who owns and operates Hello Hello Books in Rockland — remain as thrilled and supportive as ever. “Veep” airs at 10 p.m. Sundays on HBO.